Entrepreneur and military officer Lieutenant Larry Peacock is celebrating breakthrough growth in his online coaching enterprise since deciding to go “all in” at a recent training convention in Nashville. Now he’s offering a FREE three day online summit to help show other veterans how they too can get back in the saddle post military, build a successful online business and spend more time with their family. For Larry Peacock, it was a moment of sudden clarity for his own entrepreneurial coaching business after a conversation with his mentor Latasha Mitchell. She encouraged him to “go all in” and do whatever it took to attend an annual convention of ClickFunnels’ software users, leaders, founders and fans in Nashville, TN. Since then, he has formed a team of partners to host numerous online summits in 2019, starting with the Veterans Online Summit March 29 - 31 as well as a free online course that began in February for both civilians and veterans. 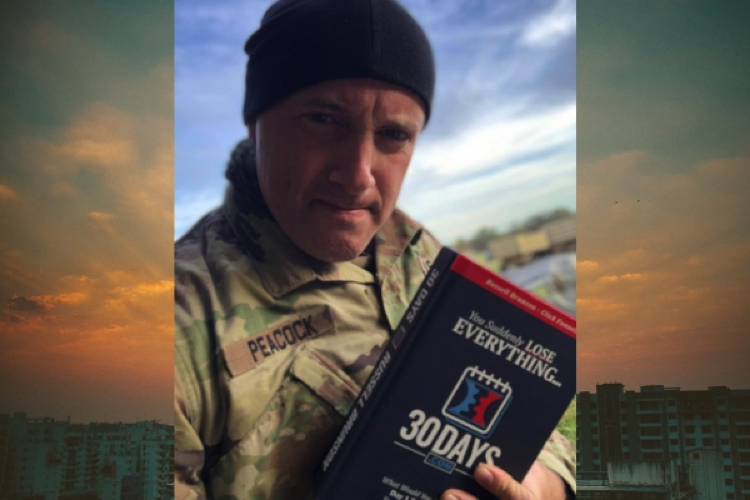 As a business coach, Peacock specializes in helping military veterans earn more family time and substantially increase their income following separation from the service by launching an online business through the use of list-building and product-creation software like ClickFunnels. His business offers a complete website or sales funnel design from A to Z including business strategy and marketing consultations. Peacock says he can help anyone launch their own business even if they have no previous experience, no contacts, or no products or services to sell. March 29-31, Peacock will be hosting the Veterans Online Summit, a virtual event, helping military veterans launch an online business using the ClickFunnels’ software. Renowned speakers within the digital marketing industry will share numerous opportunities and best practices for starting a profitable online business. “The material will be delivered in a way that anyone can understand and take action on immediately. It won’t be complicated or high-tech,” assured Peacock. Influencers presenting during the summit include Kolton G. Kottinger (Navy veteran who has sold over $1 million with one sales funnel), Bailey Richert from VirtualSummitSchool.com (hosted ClickFunnels’ 30 Days.com and the expert of virtual summits ), Blake Nubar (Top-3 ClickFunnels’ designer, selling over $1-million with one sales funnel), Brett Martucci and Matthew King (Certified ClickFunnels Partners), Danna Derricks (prestigous author of the Dream 100 Book), Jim Edwards (author of Copywriting Secrets and creator of FunnelScripts), Rachel S Lee (Dream Car Winner and YouTube expert), James Hurst (double Dream Car Winner), Jeffery Banek (sold over $10-million with one sales funnel), Spencer Mecham (sold over $1-million of ClickFunnels software as their #1 affiliate), Jamie Davidson (Army veteran selling millions on Amazon) and many more! Veterans and civilians alike can register for Larry Peacock’s free online summit at http://www.VeteransOnlineSummit.com. Lieutenant Larry Peacock goes all in to provide opportunities for fellow veteransEntrepreneur and military officer Lieutenant Larry Peacock is celebrating breakthrough growth in his online coaching business since deciding to “Go All-In". Now he's offering free online training to help fellow vets launch their own businesses.